MasterPieces: Master Of War | Warped Factor - Words in the Key of Geek. As one theatrical knight of the realm recovers from his birthday celebrations last Sunday - Sir John Hurt, the man behind the War Doctor - surely we cannot possibly allow our MasterPieces to pass without looking into the possibility of him tangling with another Sir who has also appeared as a Time Lord in the world of Who. During the 2014 novel Engines Of War, the first to feature the War Doctor predominantly, Rassilon sent the Doctor to search for the Master. The quest to find his intellectual equal was fruitless, but exactly which incarnation would it have been? 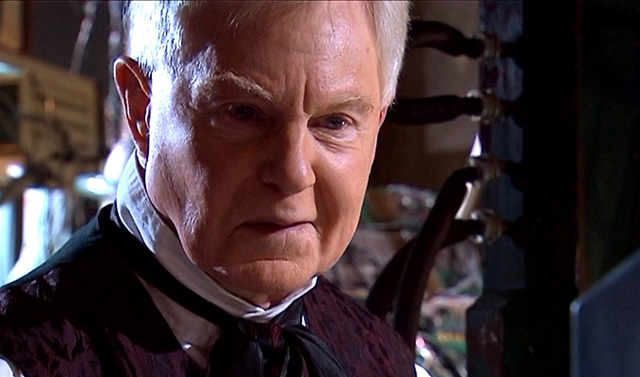 Surely, the perfect fit for Hurt's Doctor would be Sir Derek Jacobi's "Professor Yana" Master. YANA: There's movement on the surface. Another human hunt. God help him. CHANTHO: Chan should I alert the guards tho? YANA: No, no, we can't spare them. Poor beggar's on his own. One more lost soul dreaming of Utopia. CHANTHO: Chan you mustn't talk as if you've given up tho. YANA: No, no, indeed. Here's to it. Utopia. Where it is to be hoped the coffee is a little less sour. Will you join me? A fascinating Masterly what might have been we're sure you'll agree! There's also the hardly trifling matter of the Time War, & his desertion of it after having been resurrected by his people to fight. Surely there must have been occasions when the two tangled during the conflict in spite of their common goal or were even forced to work together before both became younger men, Jacobi giving way to John Simm & Hurt to David Tennant via Christopher Eccleston? All perfect material for a future War Doctor Box Set, you may think? TIME LORD: I came to warn you. An old acquaintance has arrived on this planet. DOCTOR: Oh? One of our people? DOCTOR: That jackanapes! All he ever does is cause trouble. TIME LORD: He'll certainly try to kill you, Doctor. The tribunal thought that you ought to be made aware of your danger. DOCTOR: How very kind of them. TIME LORD: You are incorrigibly meddlesome, Doctor, but we've always felt that your hearts are in the right places. But be careful. The Master has learnt a great deal since you last met him. DOCTOR: I refuse to be worried by a renegade like the Master. He's a, he's an unimaginative plodder. What he did while plodding through the War is perhaps the greatest undocumented period of his life. Closer inspection of their early years reveals plenty of occasions upon which they were forced to pool resources, & as outlined above it could be perfect War years material if they were given cause to retread that ground. Given the Doctor's great sacrifice, might he view the Master as a coward? DOCTOR: She wanted to see the universe. OHILA: She didn't miss much. It's very nearly over. DOCTOR: I could have saved her. I could have got her off, but she wouldn't listen. OHILA: Then she was wiser than you. She understood there was no escaping the Time War. You are a part of this, Doctor, whether you like it or not. DOCTOR: I would rather die. OHILA: You're dead already. How many more will you let join you? If she could speak, what would she say? DOCTOR: To me? Nothing. I'm a Time Lord. Everything she despised. OHILA: She would beg your help, as we beg your help now. The universe stands on the brink. Will you let it fall? Fast or strong, wise or angry. What do you need now? DOCTOR: I don't suppose there's a need for a doctor any more. Make me a warrior now. A third scenario could prove equally ambitious - the Master as double agent/defector! He did after all get cosy with the Daleks during Frontier In Space. But could he have had cause to ally himself with them, possibly as an agent of the Time Lords? In fulfilling his mission he could actually succeed where the Doctor failed many moons ago & bring about their final end- leaving himself unopposed as would-be ruler of the universe. Equally he could just relish playing the two sides off against each other! Success would also leave him a decent candidate for Lord President, a position he aided Goth in attempting to obtain in The Deadly Assassin. Such an embrace of the office of the position would provide a marked contrast to his later absolute hatred towards Rassilon & the rest of the High Council, of course. Well, they did put that drumbeat in his head. How prominent it is would most likely be determined by the point in the Jacobi Master's time-line we'd have reached should any new narratives for him be commissioned. Would it be the on/off irritant it seemed to the Professor as he went about his work? Or the inducement to insanity it seemed to become after he rediscovered his true self, got a young & strong body & set about shaping Earth in his own image? "Ever since I was a child. I looked into the vortex. That's when it chose me. The drumming, the call to war. Can't you hear it? Listen, it's there now. Right now." The very same child who remembered it a bit differently later on having aged a bit, via the fob watch. Nevertheless the campaign for fresh Yana/War Master narratives starts here!